Enjoy family-friendly activities such as cave climbing, canoeing, horse riding, and zip-lining in this exciting Luciole specialty cruise. 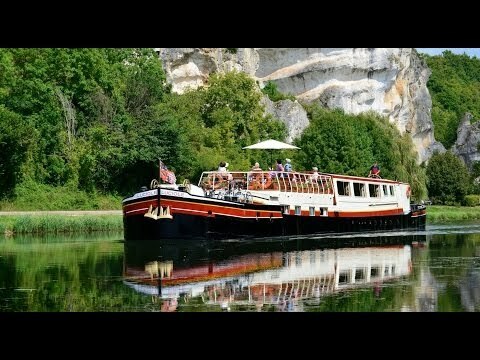 The Luciole combines pleasure cruising along the glorious Nivernais Canal with exciting activities that the whole family can enjoy. This family themed cruise offers thrills for every age with inclusions ranging from canoeing the River Yonne, to dramatic cave climbing, to treetop swinging in the picturesque Treigny. Alternative activities and excursions are also included, along with Luciole's signature excellent service, so your family can experience the ultimate cruising holiday in Burgundy. Rendezvous in Paris at a location of your choice with Luciole's representative at 2:15 pm then journey to Auxerre aboard the barge's private bus. The Luciole will be moored on the impressive river frontage of the city, overlooked by the Cathedral, the 13 - 15th Century Abbey and Parish Church. A Champagne reception and canapés welcome guests on board. Early morning tour of Auxerre then cruising to Vincelles. Spend the afternoon zip-lining and tree climbing amidst the beautiful scenery. Traversing the wires, tackling the obstacles and exciting zip-lines from the treetop. The forest features numerous circuits for varying abilities and ages - some high up in the trees. You are provided with harness and helmets. It’s great fun, and can be as challenging or easy as the individual chooses. You will also visit Guedelon - a medieval town in the making that's slated to be a scientific, historic and educational interest. Morning horse riding in the hills. Ride through the buttercup fields and rolling hills. The stables offer horses and ponies for beginners to the more experienced rider. Helmets are provided. An alternative visit to the Roman Museum at Escolives is offered in case of any changes to the weather or circumstance. You will continue with an afternoon cruise to the beautiful village of Accolay. Excursion to the market of Noyers-sur-Serein for exploration and boutique shopping. With its friendly market stalls, half timbered houses and turreted ramparts it is easy to see why Noyers is considered one of the most beautiful villages in France. In the afternoon you'll cruise towards the magnificent Mailly-le-Château. Morning cruise to Lucy-sur-Yonne. Watch out for dramatic cliffs that stand by the water's edge and the delightful ducks and geese, who have made this canal bank their home. Along the cruise route the Rochers du Parc and those at Les Saussois are regularly used by climbers. Enjoy a thrilling afternoon of rock wall climbing in an impressive old limestone quarry with a vast cave cut into the rock. Featuring long zip wires, abseiling and rock climbing on a course set into the cave walls. Different levels of difficulty mean any age can participate. This is great fun, especially for the thrill-seekers because there's an opportunity to feel scared. The café with seating area provides a perfect place for spectators, while others can wander and watch the activities of others. Morning cruise to the delightful medieval town of Clamecy, a worthy venue for the climax of your cruise. Spend the afternoon canoeing down the enchanting River Cure, past geological outcrops and under an ancient Roman bridge. It's not white water rafting - but it is fun. If time allows you can make a quick detour up to Vézelay for those wanting to see the inspiring bascilia. Alternative: The river is close to the Chateau of Bazoches and Vézelay, for those preferring a guided tour. After breakfast, the Luciole bus departs for Place Vendôme, central Paris where taxis are available for onward travel. For guests wishing to travel elsewhere in France by train or hire car, a stop can always be made in Auxerre en-route to Paris. Prices shown in Euros or US Dollar and will be converted in Australian Dollar (AUD) at time of payment using a daily ROE. An initial deposit of 30% of the total cruise fare for cabin or charter is payable at the time of booking. The balance must be paid within 100 days as per our terms and conditions and as specified in our confirmation invoice, which will be despatched when the booking form has been processed. Rates are subject to change. Cancellation policy applies to all bookings. Prefer speaking to us over the phone? Our Barge Specialists would love to help you out!